United Kingdom 7% 3,250,000 2018 1.16% 600,000 2018 Although other surveys claim higher numbers (e.g. 7% vegan, 14% veg), the Vegan Society statistics are more reliable - see ref. United States 5% - 8% 12,646,000 - 20,233,000 2018 3% 7,588,000 2018 "Results for this Gallup poll are based on telephone interviews conducted July 1–11, 2018, with a random sample of 1,033 adults, aged 18 and older, living in all 50 U.S. states and the District of Columbia." ^ "Czech 'veggie month' spotlights a meat-free lifestyle". Česká pozice. Retrieved 24 April 2019. ^ "Danes buying more vegetarian substitutes for meat and dairy". cphpost.dk. 26 July 2016. Retrieved 24 April 2019. ^ "3 of the Best Countries for Vegetarians". thedailymeal.com. 21 October 2015. Retrieved 24 April 2019. ^ "Eet jij nog steeds vlees?". groene.nl (in Dutch). 18 July 2018. Retrieved 24 April 2019. ^ "30 jaar NVV". Nederlandse Vereniging voor Veganisme (in Dutch). 10 August 2017. Retrieved 24 April 2019. ^ "Vegan communities growing, along with research on health benefits". The Manilla Times. 8 July 2014. Retrieved 24 April 2019. 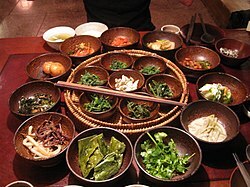 ^ "[Weekender] Korea turns corner on going meat-free". The Korea Herald. 16 June 2017. Retrieved 24 April 2019. ^ "Vegetarian? Try out these places in Kyiv". Kyiv Post. 8 March 2018. Retrieved 24 April 2019. ^ "The food habits of a nation". Thehindu.com. 14 August 2006. Retrieved 23 January 2018. ^ "opfatter"-sig-selv-som-vegetarer "Mange "opfatter" sig selv som vegetarer". Coop Analyse. Coop Analyse. 22 June 2011. Retrieved 3 June 2015. This page was last edited on 24 April 2019, at 19:40 (UTC).